Another beautiful day. We hadn’t been out of our room since arriving at our American Diner (?!?) accommodation as we ate before being carried off to our accommodation, so it was with some trepidation that we set out for breakfast. There was no doubt about it, it was an American Diner! 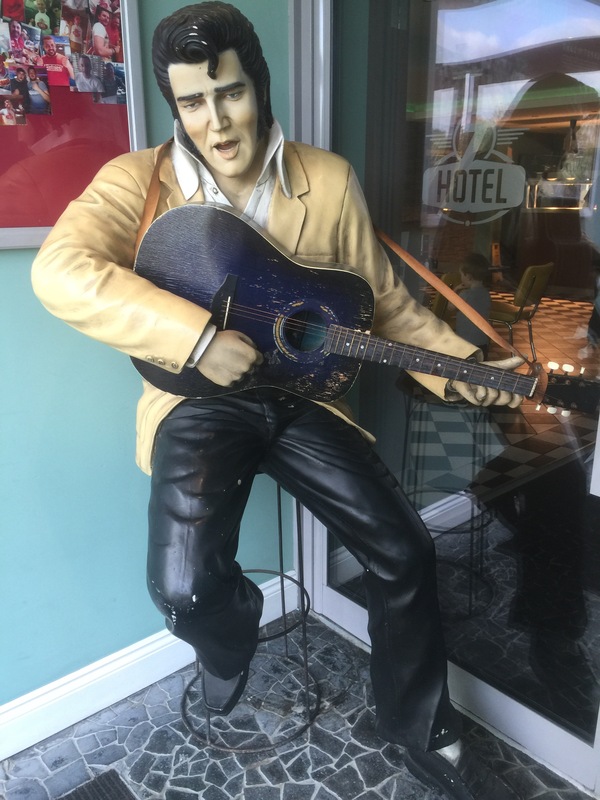 Even had an Elvis on display! The breakfast menu listed all sorts of excitements involving pancakes and maple syrup. I fairly conservatively opted for scrambled eggs with smoked salmon…….. I have to report here a bit of a technical hitch that has been developing over the last couple of days. A blister. Never has it been heard of except in the very distant past of my walking days – quelle horreur (spelling?). Banging said appendage on the bed leg had not improved the shining hour. It was very painful. This and a 17 mile day was a bit of a worry so brought in reinforcements in the shape of friends Pat and David – we were coming up to the Gravesend sector – and decided to break off at lunchtime for Sunday lunch! I realise I will lose the purists among my audience at this point but so be it……… Keith who could have carried on decided to do the chivalrous thing (or it might have been the attraction of roast beef!) and adjourn too. With this in mind and my little toe and its injury covered as best as it could be, we set off. Otford is a dear little village. 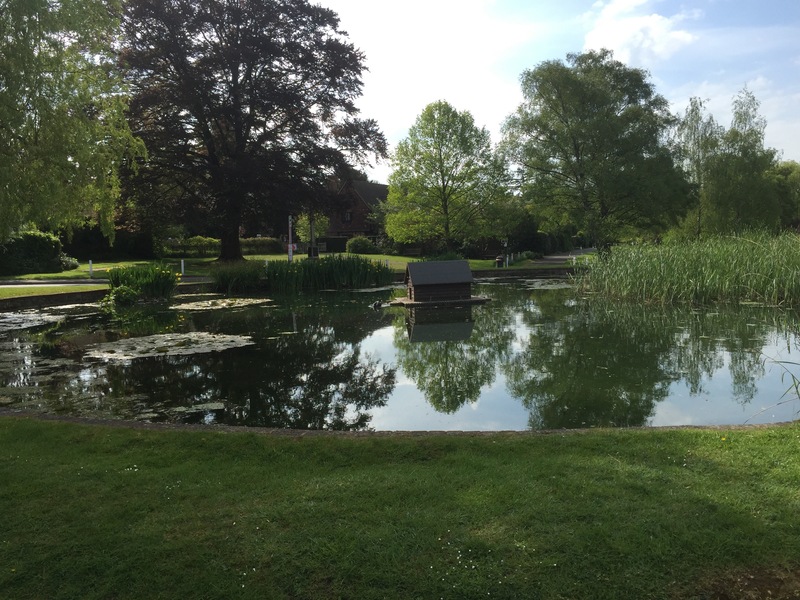 Our route started at the duck pond whose claim to fame is that it is the only pond with ‘historic building’ status in the UK. With this attraction behind us we proceeded to clamber up Otford Mount. A good old climb! From there we moved into woodland and it was interesting to note that the bluebells which have so much part of the journey so far have started to fade as the season moves on. The vibrant blue haze in woodland areas has disappeared. The path then moved through meadow, open downland giving amazing views over Kent now, and hedge lined paths. As we skirted Kemsing, dog walkers joined us on their Sunday morning strolls and runners sailed by. We came across a milestone with the distances of the route identified. Ominously there was a skull on the top – a deterrent for the light weights??? 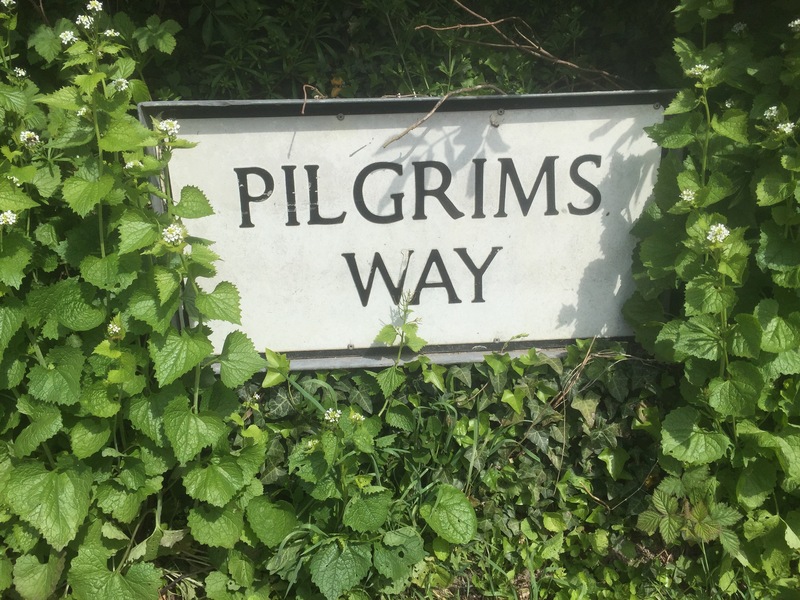 The route meandered some more before descending after a large field to a narrow lane clearly marked as the Pilgrims Way. We followed this through to the top of Wrotham Village. It was a lovely stretch, fairly flat and giving rise to thoughts to the number of feet that had walked it over hundreds of years. Please note that my pictures of Keith are always with Keith at the same distance ahead. I want it to be known that it is not that I deliberately keep at a respectful number of paces behind him, but more that his paces are longer than mine……..! 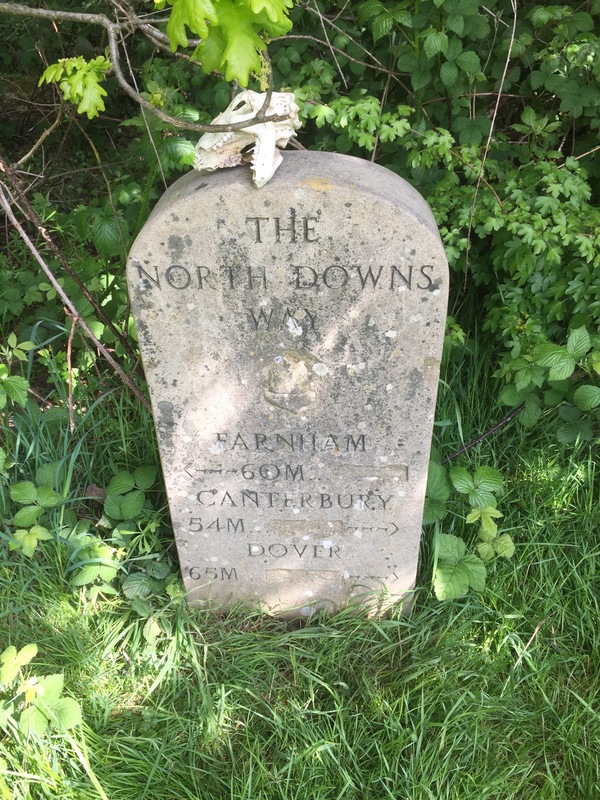 After passing the northern boundary of the village we had to negotiate our way across the A and M 20 and then we were back on the Pilgrims Way. 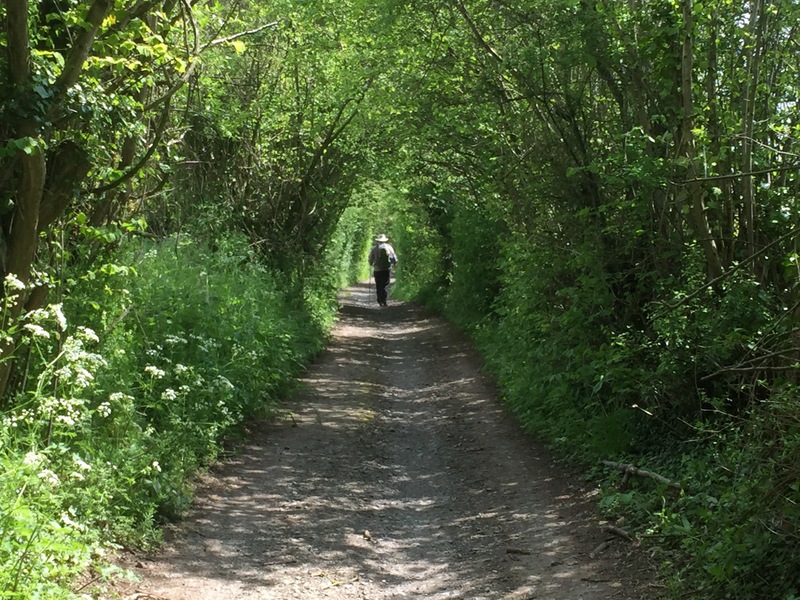 After passing several houses we veered off the narrow lane to walk along the edge of two large fields before descending on to the road once more. 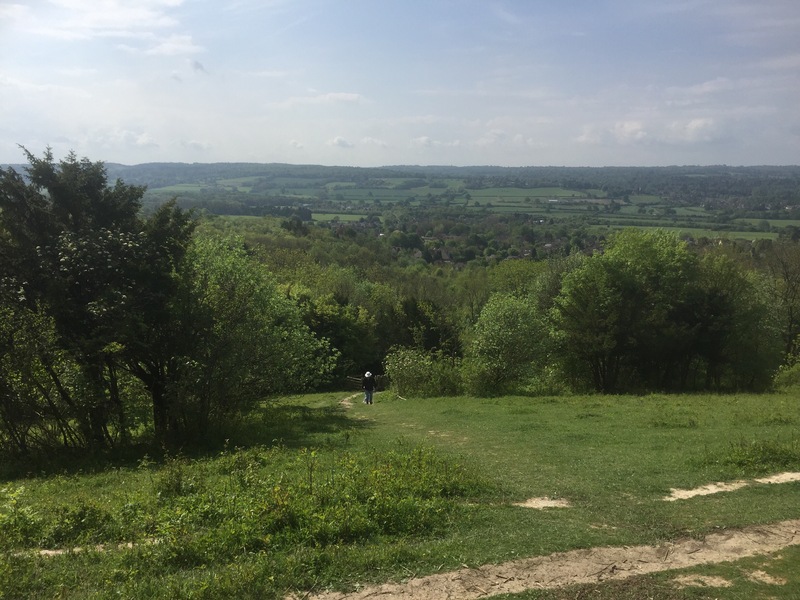 We shortly arrived at the entrance to Hognore Wood and having walked through it, began the long climb of Trottiscliffe Down (pronounced Trosley). We know the long haul up this hill as it marks the end of a favourite local walk of ours. A real case of getting your head down and plodding. Eventually we arrived at the road at the top of the hill and in no time were enjoying liquid refreshment at the tea shop in the country park while we waited for our rescuers to carry us off to the pub for lunch. Fantastic! We were duly delivered to our accommodation in Cuxton in the very late afternoon having done 11 out of the 17 miles of the day. Hopefully it will mean I can walk another day! Remember the purpose of the walk Pauline, you’re there to enjoy yourself first and complete the route second. I’m for pragmatism and pub lunches not long marches with blisters. Well said James! Feel an absolute failure on the feet stakes but it does detract from an amazing walk. Thanks for your support!